In your kitchen, drawers are the most essential places to keep your silverware and cutlery in place. The idea of kitchen drawers are to keep your utensils organized, but for some reason they wind up being messy. With Bambüsi, you can tackle this problem to make your drawers more enticing and easy to access. This drawer organizer is beautiful crafted with premium natural bamboo that is eco-friendly, sturdy, and elegant to match your wooden or modern furniture. It features a slide-out expandable section which allows you to add more silverware for more storage and even fit on small drawers if you own one. 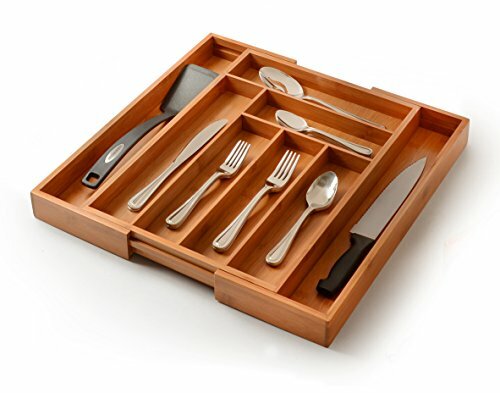 Our bamboo drawer organizer is custom-made for all types of organizing projects. Despite it is designed to make your kitchen drawers orderly, this drawer organizer can also be used for socks, jewelry, office supplies, art tools and much more.